In a review of Andrew Cayton’s Love in the Time of Revolution: Transatlantic Literary Radicalism and Historical Change, 1793-1818 (“Emotions in the Balance,” TLS, 1/17/14), Rachel Hewitt quotes from Adam Smith’s The Theory of Moral Sentiments thusly, “if you have either no fellow feeling for the misfortunes I have met with, or none that bears any proportion to the grief which distracts me; or if you have no indignation at the injuries I have suffered, or none that bears any proportion to the resentment which transports me, we can no longer converse upon these subjects.” Hewitt points out that this concern with empathy might be surprising for the author of the bible of capitalism, The Wealth of Nations. But actually it’s actual the understanding of emotion that seems to allow for free trade, in Smith’s world view. “The emotional subject’s passionate heat becomes tolerably warm; the spectator’s cool impartiality gives way to concerned compassion,” Hewitt explains. “This perfect but delicate balance of reason and compassion is ‘rational affection.’” In this regard it’s easy to see how the tolerance and equanimity of Dutch society became a breeding ground for the mercantilism of such giants as the East India Company. Smith’s thinking is also significant in the way it combines the micro with the macrocosm, ontogeny with phylogeny. Spencer coined the term Social Darwinism and free market capitalism exemplifies the survival of the fittest. But Smith obviously regarded empathy and altruism as market forces too. 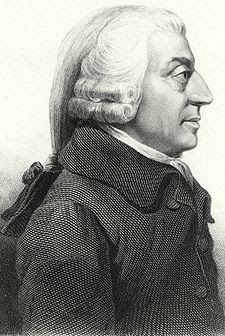 Hewitt isn’t the first critic to point out The Wealth of Nations had been preceded by a treatise (The Theory of Moral Sentiments) of such uncommon humanity. In this age of narrow Tea Party party politics that’s a far cry from true Burkean conservatism, it’s nice to be reminded that the father of modern capitalism regarded prosperity as deriving from something more than just the struggle to survive.